Feral hogs have been an introduced vertebrate pest species/game species (depending upon one's view point) in Mendocino County for around a century. Historically, during the late 1800s and early 1900s, ranchers and homesteaders owned small herds of domestic pigs that were allowed to "free range". However, over time events happened, such as the depression era, that allowed these free range pigs to be abandoned, and without any management these feral pigs became generations of truly wild feral hogs that were "wise" to the outdoor hardships such as predators. Here at the UC Hopland Research & Extension Center there have been efforts historically to exclude or eliminate the risk of wild hog damage to the rangeland, fences, developed springs, native plants, etc. Fortunately, in most years, HREC normally experiences very few feral hogs coming onto the property. However, within the last month the Center has been invaded by a group of feral hogs that has done more damage on the rangeland than ever witnessed before. Currently HREC has very limited options on how to manage the problem of these destructive pests. 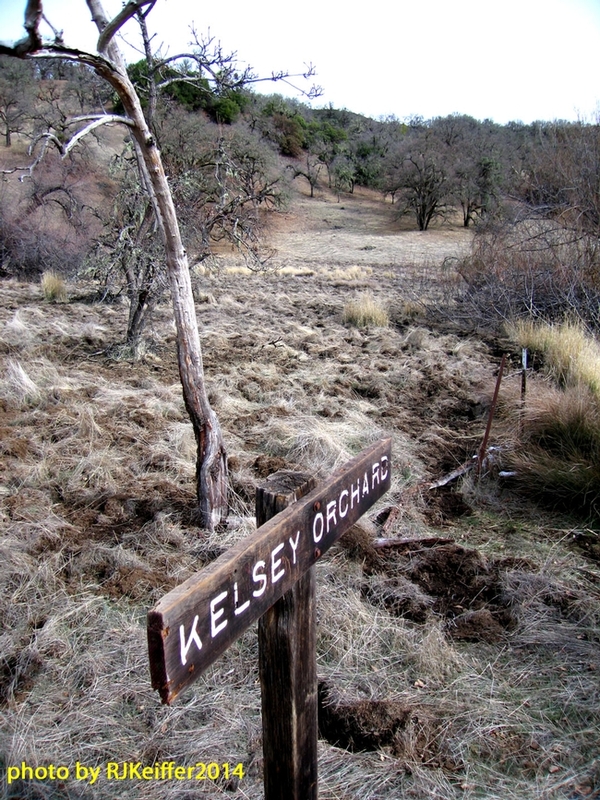 In the photo you see the meadow area near the Kelsey Orchard as it has been rooted by these pesky swines. The hogs are probably searching for delectable menu items such as earthworms and slugs.